This dish is an outfall of a chat with some friends and some sudden liberation. It was a brightly dull day, one of the few such when I was enjoying the winter fog with a cuppa and embarking on my daily chat with my regular bunch of friends from various locations. This chat window may have started around two years back and hasn’t closed ever since. Moreover, people in different time zones ensure it is constantly abuzz 24×7. On one such tireless chat, my friend Kaajal announced her menu plan for the day and she mentioned Achaari murg. Kaajal being an awesome cook by herself, we rely on her blindly for recipes, several of which she screens and picks off the net. So I asked, and got a hang of the basic recipe. This was morning. By the time dinner time struck, we had just gotten home from a short outing, I was tired, but I still wanted to try out the achaari murg. But the issue was we did not want to have rice or rotis as accompaniments. 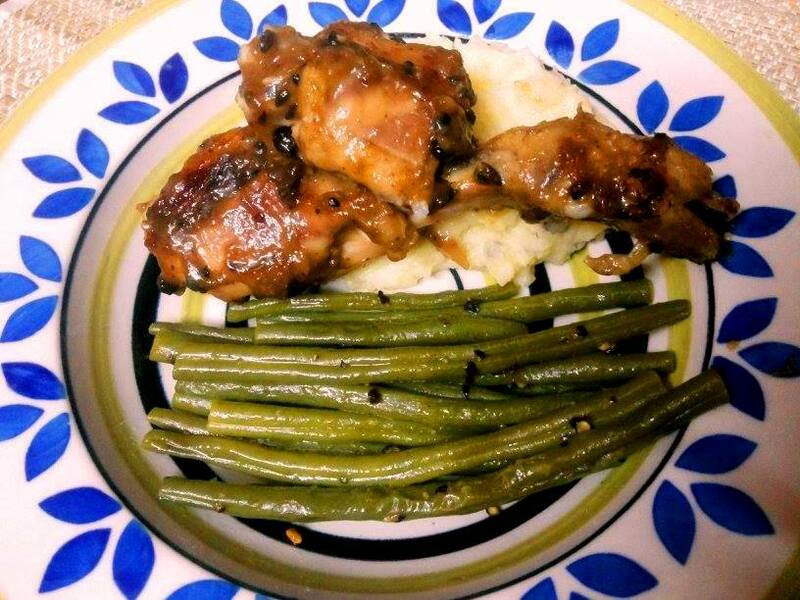 Both of us prefer regular continental sides usually, so mashed potatoes and buttered french beans it had to be. Tried to think up how I can make my achaari murg match up to those sides, and here is what I came up with. Marinate the chicken pieces with ginger-garlic paste for about 15 mins – half an hour. Add in the whole spices and let them splutter. Add the chicken pieces and sear till they brown on all sides. Add a cup of water, season with salt and sugar, cover and let it simmer till chicken is cooked. Dissolve the cornflour into a tbsp of water and the tamarind paste. Add to the cooked chicken and stir vigorously. Add the green chilly at any point in the last 5 mins of cooking. Your chicken is done when the glaze sticks to the pieces. I served it with mash and beans. It could be had with regular roti, rice or on its own too.